COLLECTION: White Christmas. White Christmas by Zen Chic is the perfect collection for decorating your home during the winter holidays in a stylish modern way. Inspired by the Scandinavian life style the colors range from chalk over eggshell, steel, graphite and charcoal with golden metallic accents. Enjoy the minimalistic elegance of White Christmas! 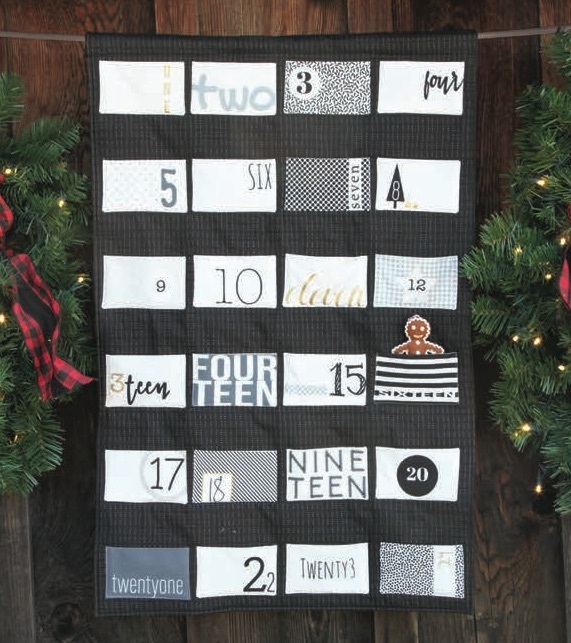 Advent Calendar Panel - Black Metallic. This Christmas-countdown-panel is 22″ wide and contains little rectangles with numbers in fun graphic styles. The sewing instructions included in the panel advise how to make 24 pockets to fill with all kinds of Christmas treats. One yard additional fabric recommended to complete Christmas panel, not included.